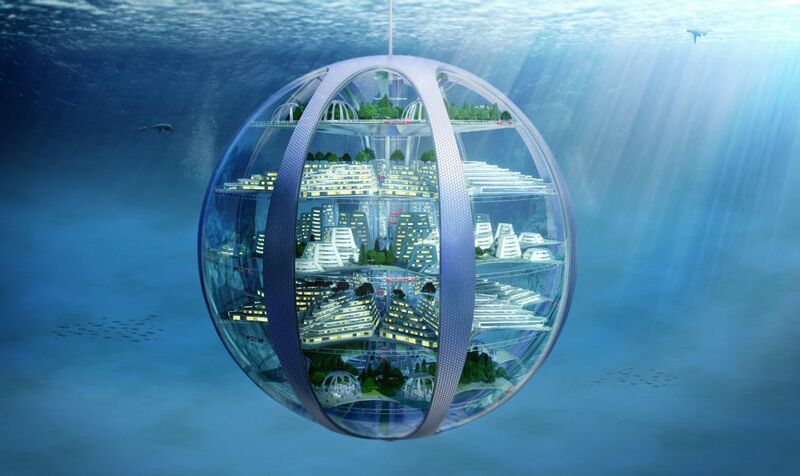 Think of giant, self-contained, undersea cities floating in the water column, not rooted to the sea floor. This is Part II in a four part series. See Part I here. Samsung has released its “SmartThings Future Living Report.” It’s a serious look at the topography of the future, at least in terms of its technological promise, and what that will mean for our lives and how we live them. It’s an extrapolation of current technological trends, as all such predictions inevitably are; but it’s less extravagant than most, more restrained and rooted in scientific realities, and it has a convincing ring of truth to it. Which is exciting, because if the folks at Samsung are right, it means that over the next century or so we’re going to be in for a very interesting ride. 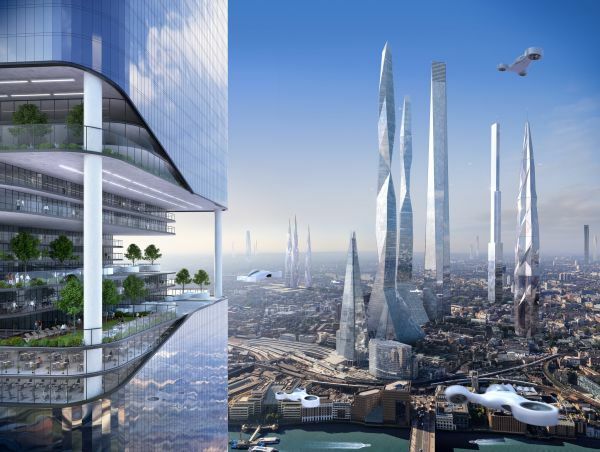 What will the cities of 2116 look like? Spectacular, beautiful, terrifying, and big…really, really big. The metropolis of the future won’t be a far cry from Fritz Lang’s vision: it will culminate that urban trend that began thousands of years ago—the ultimate descendant of Ur and Memphis, Alexandria and Rome. Advances in lightweight, super strong building materials, such as carbon nanotubes and diamond nanothread, will allow future cities to flout the laws of gravity—enormous “stratoscrapers,” kilometers high, will dwarf the likes of Dubai’s Burj Khalifa and Saudi Arabia’s projected Kingdom Tower. Throw in the fact that these colossal edifices may be 3D-printed in situ by swarms of drones, rather than laboriously and dangerously built up through human toil, and there is a great likelihood that the shapes and architectural aesthetic of these huge buildings may conform to nothing we would recognize. In reality, due to the pressures of population and the constraints of space, these buildings will be “arcologies” (“architectural ecologies”), whole vertical cities unto themselves—complete with residential, business, shopping, agricultural, entertainment, and other districts. A cloud of drone-cars will flit around them like bees about a hive, carrying us to different levels; forget sidewalks and dangerous streets. What about powering these monstrous urban environments? We’ll likely see the arrival of newer, cleaner, and more exotic forms of energy—nuclear fusion, for instance, that long-awaited dream of harnessing the power of the sun, or geothermal or tidal energy stations, or even immense solar panel farms on the moon, beaming power wirelessly to a hungry earth through microwave transmissions. And it’s not only the heavens that our urban architecture will seek to colonize. “Earth-scrapers” will tunnel 25 stories or more underground, further extending the vertical dimensions of these future arcologies. The oceans, however, will form the most coveted frontier for urbanization. Think of giant, self-contained, undersea cities floating in the water column; not rooted to the sea floor like the sessile corals or sea lilies, they’ll drift in the oceans like jellyfish, avoiding storms and seeking more congenial climates. They’ll generate fuel and breathable atmospheres through electrolysis—“cracking” seawater to produce hydrogen (for fuel cells and nuclear fusion power) and oxygen for air. Mechanical energy, from wave action, and solar power will further augment these cities’ reserves, and desalination will distill drinkable water. They’ll be fully independent, beholden to no one, and that raises its own problems—problems of jurisdiction and sovereignty. Is it possible to have nations and city-states that don’t possess an inch of surface territory?